A bimetal bayonet style thermometer with a dial face scale with a range of -18 to 105°C (0 to 220°F) may be used for certain applications in food temperature measurement. The scale must be in 1°C increments. The dial face should be a minimum of about 1 inch in diameter and is usually available in larger sizes. The stem length should be a minimum of 127 mm and may need to be much longer to measure thicker foods. Specific measurement instructions from the manufacturer of the instrument should be followed. The temperature measured is an approximate average of the temperature between the immersion point, which is approximately 2 inches up the stem and the stem tip. The bimetal bayonet style thermometer can accurately measure the temperature if relatively think or deep foods such as beef roasts and stock pots. However, this instrument does not accurately measure the temperature of food less than 2 inches thick. The thermistor and the thermocouple discussed below do not have these limitations. The recent food borne illness out breaks associated with inadequate cooking of eggs and hamburger patties has shown that it is very important to be able to accurately determine the temperatures associated with these products as well. Thermistor: This device uses the temperature sensitivity of a semiconductor junction as the sensor. Advantages are high output and fast response at a very low cost. Disadvantages include nonlinearity and a limited upper temperature range, typically 300°C. The accuracy and response time of a thermistor lend themselves very well to food temperature measurement. Infrared Thermometers: This device relies on the voltage generated by the junction of two dissimilar metals. The voltage output is proportional to the temperature of the junction. The advantages are a relatively rugged construction and a wide temperature range. Disadvantages include higher cost, lower sensitivity and non-linear output, which requires a built in reference. This technology has been used in food preparation for a number of years. Performance- Thermocouples, Thermistors, and Infrared Thermometers: The major applicable sensor types for thermocouples and thermistors have an appropriate temperature range for food product management. In addition response time is more than adequate for all these sensors. 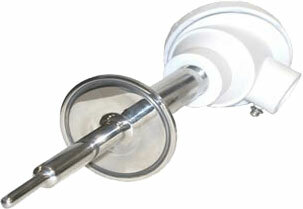 A bare sensor, however, is not recommended for food use because of fragility and difficulty cleaning. Sensors used for food temperature measurement should be encased in a metal sheath. Unfortunately, the disadvantage of a sheath is that it increases response time. As the thickness and length of the probe increase response time increases dramatically. A food probe with a maximum diameter of 4 mm is the best compromise. Smaller diameters show similar response times for a wide variety of probe materials, including stainless steel. A usable response time for food measurement should be less that 6 seconds. Probes thicker and 4 mm should a response time of 8 to 10 seconds. The TC of any sensor is defined as the time required for that sensor to respond to 63.2% of its total output signal when subject to steep change, for example, rapid immersion into a stirred hot oil bath. The step changes can be either and increase or a crease in the parameter being measured. Five constants are required for a sensor to reach 99% of its total change. A second factor in response time is placement of the sensor within the probe. The actual sensor element should be placed no more than 1 mm from the tip of the sheath. If the sensor is not firmly against the end of the probe, response time increases dramatically. As an example, if the sensor is placed 1 mm from the tip, the response time can be as high as 20 seconds. The sensor should be held in place by thermally conductive epoxy with a thermal coefficient of at least 7.0. Standard epoxies can act as a heat barrier and should be used in stationary applications only where temperature is relatively constant over a long period of time. Most yes of electrical-based thermometers are capable of effectively measuring the internal temperature of thin foods. Depending on construction, basically all are capable of at least the correct accuracy over the required temperature range. The limiting factor for effective temperature measurement is the physical characteristics of the probe that is inserted into the food. Thick metal walls and improper placement of the sensor can lead to error eo us readings. The bimetal bayonet styled thermometer may be suitable for measuring internal temperatures of thick foods. Data loggers are devices which record temperature over time. The measurements may be stored on a circular chart, printed out, or stored electronically for later reporting or downloading to a computer. These devices are primarily used for ambient or product- specific cold holding or cooling, but may also be used for cooking or smoking operations, hot holding, or special applications such as CIP systems. Some data loggers allow multiple sensors to simultaneously report data to the recorder. The frequency of recording may be adjustable from continuous to once every 24 hours depending on the application. Portable data loggers can be useful in HACCP verification work. The instrument may be either an analog or digital type. The remote sensing probes are subject to the same parameters discussed in connection with other temperature measuring devices. Proper calibration procedures should also be followed. The records generated from these devices should indicate date, time, and source of reading and should be signed by the individual responsible for the device at that time. Time/Temperature Indicators or Integrators (TTI) are simple label-like devices that continuously monitor cumulative time and temperature of food products. Some of these devices are threshold-sensitive or change in appearance when a certain threshold for temperature or time is reached. The appearance changes only if the threshold has been breached. Other devices will record the full history of the temperature and time profile. Some are coupled with bar code-like readers which download information to computers. These devices and the computer software are calibrated to mimic actual changes in the product over the range of temperatures and times encountered. This are not widely used now, but industry and public health officials agree that there are widespread potential benefits. Applications would include Reduced Oxygen Packaging (ROP) products such as so us vide or vacuum-packaged foods and some fresh products which are temperature-sensitive, such as milk and seafood. Thermometers used for regulatory inspections should be calibrated initially, and then regularly thereafter, to ensure that accuracy of measurement is maintained. This calibration should be in the range of normal regulatory concern, 5°C (41°F) to 74°C (165°F). Calibrations should include both the instrument and any interchangeable probes used with that instrument. Each piece should be separately identified in the calibration records with serial numbers or agency equipment numbers. The thermometer should be calibrated against a thermometer which has been certified by the National Institute of Standards and Technology (NIST). Standard laboratory calibration protocol such as American Public Health Association (APHA) Standards for the Examination of Dairy Products should be followed. Proper calibration documentation is essential. A wet ice and boiling water procedure may be used for field checks of the thermometer and sensor. The ice should be broken into very small pieces, packed into an insulated container, and stirred with cold water into a very thick slurry. The sensor should be placed at the very center of the container to a depth of at least 50 mm (2 inches) and should be frequently agitated. The temperature should be noted when the temperature has stabilized after 3 minutes and should be ±0.5°C (±2°F) from 0°C (32°F). The field check for higher temperatures may be conducted with boiling water. Consideration should be given to altitude above sea level in using this method. A 25 cm (>10 inch) deep container of water should be brought to a rolling boil on a stove or other source of constant heat. The probe should be carefully inserted in the boiling water until the sensor is located in the approximate center of the container with at least 76 mm (3 inches) of water below it. The temperature should be noted when the temperature has stabilized after 3 minutes and should be ±0.5°C (±2°F) from 100°C (212°F). Adjustments to some of the instruments are possible to bring them back into calibration. Others should be returned to the manufacturer since field adjustments are not possible. Some instruments are not adjustable and should be replaced.